I have several friends who write in historical settings, and they always awe me. I know how much work it takes to create a totally fictional world, so I can imagine getting all those facts right and still tell a great story has got to be twice the work. Today, author Krista Russell is here to share some tips on finding the story within the history. Krista Russell is the author of two middle grade historical novels. 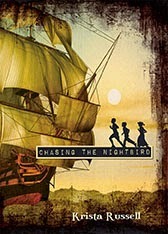 Chasing the Nightbird (Peachtree, 2011), is winner of the 2012 Massachusetts Book Award for Children’s/Young Adult Literature, a 2012 Notable Social Studies Trade Book for Young People, and a Parents’ Choice Recommended award book, and The Other Side of Free, is a 2013 Parents' Choice Silver Honor Award book. It’s one of the most common questions authors are asked. We never get tired of hearing how our favorite stories were born and we too are always eager for a peek-behind-the-curtain into the processes of our favorite authors. You could say that all who write historical fiction get their ideas from history. Though I’ve not (yet) found a story in a painting, I can identify with her process. Before visiting Fort Mose in St. Augustine, Florida, I had no idea that the earliest version of the Underground Railroad actually ran south. Enslaved people escaping south? It was a fact that “stopped me in my tracks”. I had to know more. (asked with pained expression, with or without wrinkled nose). This may be the most common question historical fiction writers face. Have to? Are you kidding? We get to! Those of us who write historical fiction take to research like pigs to mud. We love the rooting and digging. Primary sources are our manna. Loosely defined as a document or object which was written or created during the time under study, a primary source can take any number of forms: artifact, letter, map, memoir, or painting (among many others). These provide a direct portal to the past and often the spark that ignites a story. Some of our most exciting moments take place in the hushed stacks of historical society libraries or in the hallowed halls of the National Archives, where you can turn the yellowed, salt-stained pages of a ship’s log penned over two hundred and fifty years ago. Researching the past has never been easier. We can now do it from the comfort of our own couches. Every day, new collections of primary sources are digitized and made available online to the public. Some of my favorite sites are Library of Congress, Smithsonian and National Archives. The biggest problem with research is that we often have a hard time knowing when to say when. One discovery leads to another and there’s always a fresh angle to examine, a new lead to follow, or an additional avenue to explore. And do you know what they call the HF writer who can’t stop researching? Unpublished. At some point we have to stop digging and start writing. One of the things I love most about historical fiction is its mix of discovery and invention. Probably the second most common question posed to authors of historical fiction. And it can be a difficult one to answer. Broadly defined, historical fiction is a fictional story in which elements of history, be they persons, events, or settings, play a central role. How much is discovery and how much invention? The answer varies from author to author, story to story. Some of us get a bit defensive, pointing out that the record of the past is not complete. And besides, doesn’t all history contain an element of fiction, or at least speculation? Ask three people who witnessed an event what happened, and you’ll get three different versions. While a historian strives for factual accuracy, a writer of historical fiction wants to get the facts right, but is perhaps more focused on emotional truth. It’s through invention and motivation that we flesh out the bones and bring the past to life. In workshops for both students and adults, I’ve done an exercise in historical flash fiction – a five-minute blast of the past. You could use a primary source as a prompt (a photograph, map, or work of art). Or you could use what you already know about a person or event from history. The emphasis here is not on documentary evidence (research), but on the murky waters of (character) motivation. Choose a POV character and set your timer. It could be a real person from history or a fictional character living through a historic event. Put yourself into that character’s head and ready, steady, write. What do you think? Even if this short exercise hasn’t inspired you to take up historical fiction, I know from experience it’s an effective cure for writer’s block. It is 1739. Young Jem has been rescued from slavery and finds himself at Fort Mose, a settlement in Florida run by the Spanish. He is in the custody of an ornery and damaged woman named Phaedra, who dictates his every move. When Jem sets out to break free of her will, an adventure begins in which Jem saves a baby owl, a pair of runaway slaves, and, eventually, maybe all the residents of Fort Mose. While Jem and the other characters are fictitious, the story is based on historical record. Fort Mose was the first legally sanctioned free African settlement in what is now the United States. In 1994 the site was designated a National Historic Landmark and listed on the National Register of Historic Places. In 2009, the National Park Service named Fort Mose a precursor site on the National Underground Railroad Network to Freedom. Wow. Glad I found this today. I'm currently outlining my first middle-grade novel, and it's a historical. This was by accident. I've always been intimidated by the historical genre simply because of the research required. But my fascination with history overrode my fear. I'm fascinated, specifically, with Naval history. And I happen to be a former Navy Brat. Dad was a lifer, so I've been around. Recently I became fascinated with the USS Scorpion disaster. The Scorpion was the last US sub lost at sea, in 1968. Of all the material written about the Scorpion, there is not one book, fiction or non-fiction, written about the families. So in steps Ron, former Brat, who says, "There were kids standing on that pier waiting for their fathers to come home, and they never did." That really happened. Subs only surface and radio in a few hours before they're due, so the families were waiting on the pier. So my novel is from the POV of an eleven year old boy, one of the Brats waiting on a father who wouldn't be coming home. The problem? This is only 1968. Those people are still around. Yes, I can talk to them. But if I mess up details, a lot of people will know. Will the details hurt the story? No, because the real story is the boy and his coming of age after the loss. But I still want to get those details right, because there are other stories there--the life of a Navy Brat, the school, the housing, the shipyard, etc. Yeah, I have the advantage of experience, but I was born in '66, so I'll be struggling in places. But you're right. The research is a blast. I'm learning things all the time, and some of those will spawn other stories. So look for more Navy Brat historicals. If you love it, it ain't work. Wonderful post! I don't write HF and the very idea of it is daunting, but I LOVE the idea of getting inspiration from a painting. I am a painter myself and when I go to an museum exhibit, sometimes there are those paintings that literally stop me in my tracks. Can't wait to listen to Tracy Chevalier's TED talk! Thanks for giving me this jolt of idea-generating inspiration. This is fantastic, as I have long held a heightened interest in the historical genre. Thank you so much for writing this post. One thing I have struggled with in my current WIP, is being historically accurate with the expressions used in my character's dialogue. For example: contractions, slang, and other words/phrases that are common today. Oh, your post is so timely for me! My WiP was inspired by my long-time hobby of currencies, US and abroad. I had recently stumbled across the paper money used in the earliest days of the US and became intrigued. Just a small dip into research revealed weird things about the politics of the time, the power struggles, and how the tiny paper currencies (for 5 and 10 cents) figured in it all. Love this post and your quotes. Emotional Truth--YES! And boy, is it hard to stop researching. It is the thrill of the hunt! I like the whole `get to' do research instead of `have to.' It's a nice perspective change. I've long found the idea of research very intimidating, but I love reading mythology, Classical Greek writings, and anything about early archeology. If I consider those research instead of just netting ideas, I probably do a lot more of it than I realize.